Coffee seems to be universal. People in every country and culture consume the beverage on a daily basis, and the medical world has studied its health effects for decades. 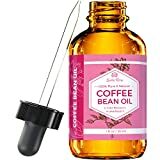 You can even make an essential oil from the coffee beans not good enough to roast and sell and most people don’t realize that there are coffee essential oil benefits as well. Many people have sought out alternative methods of restoring their hair or saving what hair may be remaining. Traditional therapies prescribed by the medical community may have no effect and end up being costly to implement. There is also the issue of using chemicals, which may affect the body in other, unforeseen, ways. You can add a couple drops to vinegar to create a surface spray that will help keep your house clean and reminding you of a fresh cup of coffee at the same time. Mix the coffee oil with a carrier oil and apply it anywhere on your body where you have cellulite. All the beneficial chemicals will be absorbed through your skin, and you may begin to see changes in your body. Add coffee essential oil to your diffuser when you need to be relaxed. Coffee essential oil blends well with ylang-ylang, which is also a mood enhancer with a slight floral smell that shouldn’t overwhelm the smell of coffee, or sandalwood if you prefer a less citrus scent. Add some coffee oil to witch hazel to add in the astringent properties found in it. The oil will sink into your skin and work to protect you from further damage. To get these benefits, you can simply add a few drops to your diffuser and breathe in it. Coffee essential oil blends wonderfully with rose oils, ylang-ylang, and sandalwood. You can also make a massage oil and use it topically. I’ll admit that I’m probably just as big a fan of coffee as the next person. Maybe not my husband with his pot a day habit, but I like to have it on cold mornings so I can have a caffeine bump while I warm my fingers on a ceramic mug. I’m not a huge fan of tall lattes smothered in whip cream and filled with sugar, but I understand the appeal. I’m always on the lookout for anything that has properties that can help regulate mood. I often have bouts of anxiety that come along with my depression and don’t really want to take more medication than necessary to function. I already use different combinations, especially citrus mixes, to help but coffee oil was unknown to me. It shocked me to discover that there was an oil made from one of my favorite beverages. Coffee oil for my diffuser to have my entire house smell like a freshly brewed cup? Just the smell alone seems to perk me up when I’m tired or find it hard to get out of bed. Sometimes it is enough to open the bottle and enjoy the undiluted scent. I’m suddenly invigorated by just the memory I have of drinking a warm cup of coffee and feel relaxed when I experience the pleasant memories I associate with it. It’s also useful when I don’t really need to have another cup but would still like to experience the effect it has on my body. This lotion is taking advantage of the effect that coffee oil has on the skin, such as increasing blood flow and encouraging collagen production. Collagen is what gives skin its firm look and can be affected by oxidative stress caused by free radicals in the environment. Produced with aloe vera as well, it can soothe any irritation in the skin as well. Since it is a moisturizing cream, you can apply this anywhere on your body, including those areas with stubborn cellulite that doesn’t seem to disappear even with diet and exercise. This oil is a highly concentrated version of the oil that you may find in many beauty products already. It is formulated so you can use it in your diffuser for that pick me up that is associated with coffee, but you may not be able to sit around and enjoy a cup. This oil is also perfect if you are looking to add coffee to your skincare routine. Start with one or two drops in your favorite carrier oil and apply to your face or hands. You may start to see a reduction in the signs of aging. Due to a slight sedative effect, people who are already taking sedatives should not use coffee essential oil. There may be a reaction in people who are sensitive to caffeine. Coffee Oil contains a small amount of caffeine. Pregnant women should not use this oil if they are avoiding caffeine consumption. Use of this oil on the skin may result in irritation. Test a patch of skin before using and always dilute with water or a carrier oil before application. Be sure to use a therapeutic grade of oil to prevent any reactions. I have to admit that I was pleasantly surprised to find that not only is there an oil created from one of the most common drinks in the world, but that it has a bevy of health benefits as well. Please be sure to share this information with anyone who may be a fan of the drink, but isn’t aware of the number of coffee oil uses for the rest of the body as well.